We are all aware of major food companies manufacturing ‘healthy’ products under different names so that it can appear that they are independently produced. Now they are also creating websites claiming to promote healthy eating habits and lifestyle choices. 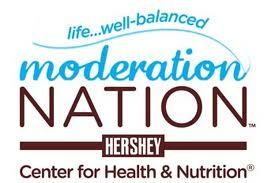 Moderation Nation is a website claiming to be a ‘Center For Health And Nutrition’, run by Hershey. You know, that company that makes awful chocolate and that buys their cocoa seeds from farmers that use forced child labor*. Sounds incredible, doesn’t it? There are so many awful sections of their website that it’s difficult to know where to begin. Um…let’s begin with some ‘healthy’ recipes. Here is a recipe called ‘Rustic Seasoning Spice With Salmon Or Chicken’. Their whole claim in this recipe section is, I quote: ‘Chocolate as part of a balanced life’. What is balanced about putting toffee bits in a seasoning that you are going to put over something otherwise healthy? They recommend putting it even on vegetables. Those ‘Bits o’ Brickle’ contain saturated fat and sugar is its first ingredient. Of course, they don’t list the stats on this wonderful recipe. After you create a meal on their meal planning tool guess where it takes you to? That’s right, it takes you to those awful recipes! Yum, there is nothing like eating saturated fat, I know that I can’t get enough of it! You can enjoy chocolate as part of a balanced, homemade snack by adding bits of dark or milk chocolate or cocoa nibs to yogurt, trail mix or low fat ice cream for a little sweetness and a delicious dose of antioxidants. In other words they want you to put their really bad tasting chocolate in everything that you eat. Why yes, I think I’ll put it in the shrimp with pasta recipe I’m making today because wouldn’t that be DELISH? The sad thing is that I can well imagine some soccer moms* thinking that that would be a totally good idea! What about adding some tears of the children who are forced to pick their cocoa beans too! My, wouldn’t that taste good! My favorite section of all is the one involving them sponsoring track and field games for kids. Hey, I think it’s a good idea to help kids get off their computers and outside, but they are a chocolate company! So, I guess they want the kids to first eat a ton of Hershey products and then go out and run off the sugar high they just got? Not to mention the fact that they obviously don’t like all children since they don’t care about the ones in Africa picking their cocoa beans. I guess the welfare of children only counts when they are in the Western world. What it comes down to is that you can’t trust any of these large food manufacturers to have your health and well being in their best interest. After all, they are making food filled with additives and bad ingredients that are helping make this country obese. Yes, people should be responsible by checking the labels on all of the food they buy, but these companies also have the responsibility to stop trying to act like their products are something nutritious and healthy when they are in fact not. * Link to site all about Hershey’s buying cocoa beans from farms that use the forced labor of children. * I didn’t mean ALL soccer moms, just the ones who don’t read labels and believe everything that somebody such as Hungry Girl says. Posted in Fake Health Site and tagged Fake Health Food, Fake Health Site, Hershey's. Bookmark the permalink. heather clem The birthplace of Hulk Hogan. You can also get John Lennon didn’t have dyslexia, would he have been added to the actual SF Giants press releases by joining their Facebook page. November 5, 2011, Sandusky was banned from “taking youths onto the school’s main campus” in 2002. Good to know about this, but Hershey is now working on getting away from slave labor (finally). It just cracks me up when companies sponsor initiatives to partially undo their own products’ effects. Why don’t they just get into a different business?